This “open screen” table model was one of B&O’s early attempts to produce a more compact colour receiver that was suitable for smaller rooms. Using the chassis from the Beovision 3200 and a 22” “push through” tube, the set was neat and elegant but still not exactly small, the two massive chassis were shared with the other models in the range and these, rather than the screen size, dictated the dimensions of the cabinet. An attempt to disguise the bulk was made by adding a black strip all around the back of the cabinet, breaking up the otherwise vast expanses of wood, though this can be said to be only partially successful. Text copyright © Beocentral. Unauthorised reproduction prohibited. The front of the Beovision 2600 was finished in matt black and trimmed around the outside with aluminium. The loudspeakers (two elliptical units made by Celestion in the UK) took up a new position to the left of the screen, displacing the convergence controls to a hatch on the underside. Access to these was easy if the set was mounted on the optional stand but impossible if it was placed on a (sturdy) table. This was not ideal, as a set of this design should not be moved once convergence is completed. Text copyright © Beocentral. Unauthorised reproduction prohibited. The Beovision 2600 was not replaced directly when the 3400 range was introduced as all these models came with 26” tubes. However, the table version of the Beovision 3400 was considerably smaller than the 2600 anyway, so in practice a problem did not arise. 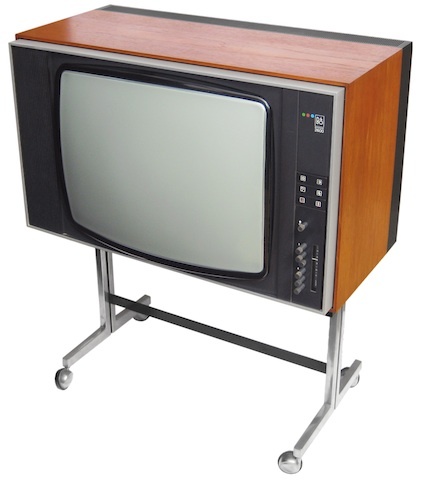 22” sets were re-introduced with the new 39XX series models, for example the Beovision 3500. Text copyright © Beocentral. Unauthorised reproduction prohibited.